Acetylation refers to the process of introducing an acetyl group (resulting in an acetoxy group) into a compound, namely the substitution of an acetyl group for an active hydrogen atom. A reaction involving the replacement of the hydrogen atom of a hydroxyl group with an acetyl group (CH3 CO) yields a specific ester, the acetate. Acetic anhydride is commonly used as an acetylating agent reacting with free hydroxyl groups. For example, it is used in the synthesis of aspirin and heroin. Acetylation is an important modification of proteins in cell biology; and proteomics studies have identified thousands of acetylated mammalian proteins. Acetylation occurs as a co-translational and post-translational modification of proteins, for example, histones, p53, and tubulins. Among these proteins, chromatin proteins and metabolic enzymes are highly represented, indicating that acetylation has a considerable impact on gene expression and metabolism. In bacteria, 90% of proteins involved in central metabolism of Salmonella enteric are acetylated. N-terminal Acetylation is catalyzed by a set of enzyme complexes, the N-terminal acetyltransferases (NATs). NATs transfer an acetyl group from acetyl-coenzyme A (Ac-CoA) to the α-amino group of the first amino acid residue of the protein. Different NATs are responsible for the acetylation of nascent protein N-termini, and the acetylation was found to be irreversible so far. Crystal structure of the NatA complex (Naa10 and Naa15) from Schizosaccharomyces pombe. 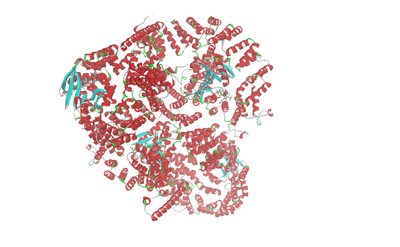 The red chains represent the auxiliary subunit Naa15 and the blue chains the catalytic subunit Naa10. NatB complexes are composed with the catalytic subunit Naa20p and the auxiliary subunit Naa25p, which are both found in yeast and humans. In yeast, all the NatB subunits are ribosome-associated; but in humans, NatB subunits are both found to be ribosome-associated and non-ribosomal form. NatB acetylates the N-terminal methionine of substrates starting with Met-Glu-, Met-Asp-, Met-Asn- or Met-Gln- N termini. 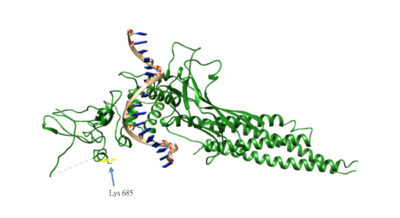 NatF is a newly identified NAT in 2011, which is composed with Naa60p enzyme. Till now, NatF is only found in higher eukaryotes, but not in lower eukaryotes. Compared to yeast, NatF contributes to the higher abundance of N-terminal acetylation in humans. NatF complex acetylates the N-terminal methionine of substrates Met-Lys-, Met-Leu-, Met-Ile-, Met-Trp- and Met-Phe N termini which are partly overlapping with NatC and NatE. NatF has been shown to have an organellar localization and acetylates cytosolic N-termini of transmembrane proteins. N-terminal acetylation has been shown that it can steer the localization of proteins. Arl3p contains a Phe (Yeast Arl3p), Tyr (Human Arl3p) which could be acetylated by NatC. Arl3p is one of the ‘Arf-like’ (Arl) GTPases, which is crucial for the organization of membrane traffic. It requires its Nα-acetyl group for its targeting to the Golgi membrane by the interaction with Golgi membrane-residing protein Sys1p. If the Phe or Tyr is replaced by an Ala at the N-terminal of Arl3p, it can no longer localized to the Golgi membrane, indicating that Arl3p needs its natural N-terminal residues which could be acetylated for proper localization. The discovery of histone acetylation (and deacetylation) has been proved to be important in the transcriptional regulation in the field of epigenetics. However, histone is not the only protein that is highly regulated by posttranslational acetylation. In the following examples, we choose the following proteins that are important in biology that regulate the important signal transduction in biology by acetylation of proteins. In addition, the acetylation regulation on those proteins also related to human diseases and has a potential for the development for therapy. The p53 protein is a tumor suppressor that plays an important role in the signal transactions in cells, especially in maintaining the stability of the genome by preventing mutation. Therefore, it is also known as “the guardian of the genome." In addition, it also regulates the cell cycle and arrests cell growth by activating a regulator of the cell cycle, p21. Under severe DNA damage, it also initiates programmed cell death.The function of p53 is negatively regulated by oncoprotein Mdm2. Studies suggested that Mdm2 will form a complex with p53 and prevent it from binding to specific p53-responsive genes. Since the beginning of the 20th century, acetylation of wood was researched as a method to upgrade the durability of wood in resistance against rotting processes and molds. Secondary benefits include the improvement of dimensional stability, improved surface hardness, and no decrease in mechanical properties due to the treatment. The physical properties of any material are determined by its chemical structure. Wood contains an abundance of chemical groups called “free hydroxyls”. Free hydroxyl groups adsorb and release water according to changes in the climatic conditions to which the wood is exposed. This is an explanation as to why wood swells and shrinks. It is also believed that the digestion of wood by enzymes initiates at the free hydroxyl sites – which is one of the principal reasons why wood is prone to decay. Accoya wood is a commercial, patented acetylated wood. ↑ Choudhary C, Kumar C, Gnad F, Nielsen ML, Rehman M, Walther TC, Olsen JV, Mann M (2009). "Lysine acetylation targets protein complexes and co-regulates major cellular functions". Science. 325 (5942): 834–840. Bibcode:2009Sci...325..834C. doi:10.1126/science.1175371. PMID 19608861. ↑ Fritz KS, Galligan JJ, Hirschey MD, Verdin E, Petersen DR (2012). "Mitochondrial acetylome analysis in a mouse model of alcohol-induced liver injury utilizing SIRT3 knockout mice". J. Proteome Res. 11 (3): 1633–1643. doi:10.1021/pr2008384. PMC 3324946 . PMID 22309199. ↑ Brook, Tom. "Protein Acetylation: Much More than Histone Acetylation". Cayman Chemical. ↑ Zhao S, Xu W, Jiang W, Yu W, Lin Y, Zhang T, Yao J, Zhou L, Zeng Y, Li H, Li Y, Shi J, An W, Hancock SM, He F, Qin L, Chin J, Yang P, Chen X, Lei Q, Xiong Y, Guan KL (2010). "Regulation of cellular metabolism by protein lysine acetylation". Science. 327 (5968): 1000–1004. Bibcode:2010Sci...327.1000Z. doi:10.1126/science.1179689. PMC 3232675 . PMID 20167786. ↑ Wang, Qijun; Zhang, Yakun; Yang, Chen; Xiong, Hui; Lin, Yan; Yao, Jun; Li, Hong; Xie, Lu; Zhao, Wei (2010-02-19). "Acetylation of Metabolic Enzymes Coordinates Carbon Source Utilization and Metabolic Flux". Science. 327 (5968): 1004–1007. doi:10.1126/science.1179687. ISSN 0036-8075. PMC 4183141 . PMID 20167787. 1 2 Van Damme P, Hole K, Pimenta-Marques A, Helsens K, Vandekerckhove J, Martinho RG, Gevaert K, Arnesen T (2011). "NatF contributes to an evolutionary shift in protein N-terminal acetylation and is important for normal chromosome segregation". PLoS Genet. 7 (7): e1002169. doi:10.1371/journal.pgen.1002169. PMC 3131286 . PMID 21750686. ↑ Starheim KK, Gevaert K, Arnesen T (2012). "Protein N-terminal acetyltransferases: when the start matters". Trends Biochem. Sci. 37 (4): 152–161. doi:10.1016/j.tibs.2012.02.003. PMID 22405572. ↑ Liszczak G, Goldberg JM, Foyn H, Petersson EJ, Arnesen T, Marmorstein R (2013). "Molecular basis for N-terminal acetylation by the heterodimeric NatA complex". Nat. Struct. Mol. Biol. 20 (9): 1098–105. doi:10.1038/nsmb.2636. PMC 3766382 . PMID 23912279. ↑ Starheim KK, Gromyko D, Velde R, Varhaug JE, Arnesen T (2009). 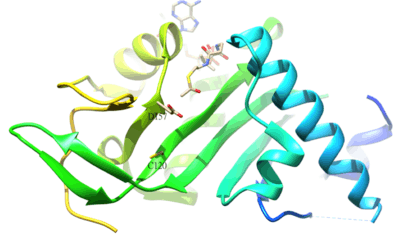 "Composition and biological significance of the human Nalpha-terminal acetyltransferases". BMC Proc. 3 Suppl 6 (Suppl 6): S3. doi:10.1186/1753-6561-3-s6-s3. PMC 2722096 . PMID 19660096. ↑ Arnesen T, Van Damme P, Polevoda B, Helsens K, Evjenth R, Colaert N, Varhaug JE, Vandekerckhove J, Lillehaug JR, Sherman F, Gevaert K (2009). "Proteomics analyses reveal the evolutionary conservation and divergence of N-terminal acetyltransferases from yeast and humans". Proc. Natl. Acad. Sci. U.S.A. 106 (20): 8157–8162. Bibcode:2009PNAS..106.8157A. doi:10.1073/pnas.0901931106. PMID 19420222. ↑ Arnesen T, Starheim KK, Van Damme P, Evjenth R, Dinh H, Betts MJ, Ryningen A, Vandekerckhove J, Gevaert K, Anderson D (2010). "The chaperone-like protein HYPK acts together with NatA in cotranslational N-terminal acetylation and prevention of Huntingtin aggregation". Mol. Cell. Biol. 30 (8): 1898–1909. doi:10.1128/mcb.01199-09. PMC 2849469 . PMID 20154145. ↑ Hole K, Van Damme P, Dalva M, Aksnes H, Glomnes N, Varhaug JE, Lillehaug JR, Gevaert K, Arnesen T (2011). "The human N-alpha-acetyltransferase 40 (hNaa40p/hNatD) is conserved from yeast and N-terminally acetylates histones H2A and H4". PLoS ONE. 6 (9): e24713. Bibcode:2011PLoSO...624713H. doi:10.1371/journal.pone.0024713. PMC 3174195 . PMID 21935442. ↑ Gautschi M, Just S, Mun A, Ross S, Rücknagel P, Dubaquié Y, Ehrenhofer-Murray A, Rospert S (2003). "The yeast N(alpha)-acetyltransferase NatA is quantitatively anchored to the ribosome and interacts with nascent polypeptides". Mol. Cell. Biol. 23 (20): 7403–7414. doi:10.1128/mcb.23.20.7403-7414.2003. PMC 230319 . PMID 14517307. ↑ Aksnes (March 3, 2015). "An Organellar Nα-Acetyltransferase, Naa60, Acetylates Cytosolic N Termini of Transmembrane Proteins and Maintains Golgi Integrity". Cell Reports. 10: 1362–74. doi:10.1016/j.celrep.2015.01.053. PMID 25732826. ↑ Hollebeke J, Van Damme P, Gevaert K (2012). "N-terminal acetylation and other functions of Nα-acetyltransferases". Biol. Chem. 393 (4): 291–8. doi:10.1515/hsz-2011-0228. PMID 22718636. ↑ Hershko A, Heller H, Eytan E, Kaklij G, Rose IA (1984). "Role of the alpha-amino group of protein in ubiquitin-mediated protein breakdown". Proc. Natl. Acad. Sci. U.S.A. 81 (22): 7021–5. Bibcode:1984PNAS...81.7021H. doi:10.1073/pnas.81.22.7021. PMC 392068 . PMID 6095265. ↑ Hwang CS, Shemorry A, Varshavsky A (2010). "N-terminal acetylation of cellular proteins creates specific degradation signals". Science. 327 (5968): 973–977. Bibcode:2010Sci...327..973H. doi:10.1126/science.1183147. PMID 20110468. ↑ Behnia R, Panic B, Whyte JR, Munro S (2004). "Targeting of the Arf-like GTPase Arl3p to the Golgi requires N-terminal acetylation and the membrane protein Sys1p". Nat. Cell Biol. 6 (5): 405–413. doi:10.1038/ncb1120. PMID 15077113. ↑ Starheim KK, Gromyko D, Evjenth R, Ryningen A, Varhaug JE, Lillehaug JR, Arnesen T (2009). "Knockdown of human N alpha-terminal acetyltransferase complex C leads to p53-dependent apoptosis and aberrant human Arl8b localization". Mol. Cell. Biol. 29 (13): 3569–3581. doi:10.1128/mcb.01909-08. PMC 2698767 . PMID 19398576. ↑ Gromyko D, Arnesen T, Ryningen A, Varhaug JE, Lillehaug JR (2010). "Depletion of the human Nα-terminal acetyltransferase A induces p53-dependent apoptosis and p53-independent growth inhibition". Int. J. Cancer. 127 (12): 2777–2789. doi:10.1002/ijc.25275. PMID 21351257. ↑ Yi CH, Pan H, Seebacher J, Jang IH, Hyberts SG, Heffron GJ, Vander Heiden MG, Yang R, Li F, Locasale JW, Sharfi H, Zhai B, Rodriguez-Mias R, Luithardt H, Cantley LC, Daley GQ, Asara JM, Gygi SP, Wagner G, Liu CF, Yuan J (2011). "Metabolic regulation of protein N-alpha-acetylation by Bcl-xL promotes cell survival". Cell. 146 (4): 607–620. doi:10.1016/j.cell.2011.06.050. PMC 3182480 . PMID 21854985. ↑ Kamita M, Kimura Y, Ino Y, Kamp RM, Polevoda B, Sherman F, Hirano H (2011). "N(α)-Acetylation of yeast ribosomal proteins and its effect on protein synthesis". J Proteomics. 74 (4): 431–441. doi:10.1016/j.jprot.2010.12.007. PMID 21184851. ↑ Yu M, Gong J, Ma M, Yang H, Lai J, Wu H, Li L, Li L, Tan D (2009). "Immunohistochemical analysis of human arrest-defective-1 expressed in cancers in vivo". Oncol. Rep. 21 (4): 909–15. doi:10.3892/or_00000303. PMID 19287988. ↑ Kalvik TV, Arnesen T (2013). "Protein N-terminal acetyltransferases in cancer". Oncogene. 32 (3): 269–276. doi:10.1038/onc.2012.82. PMID 22391571. ↑ Sadoul K, Boyault C, Pabion M, Khochbin S (2008). "Regulation of protein turnover by acetyltransferases and deacetylases". Biochimie. 90 (2): 306–12. doi:10.1016/j.biochi.2007.06.009. PMID 17681659. ↑ Glozak MA, Sengupta N, Zhang X, Seto E (2005). "Acetylation and deacetylation of non-histone proteins". Gene. 363: 15–23. doi:10.1016/j.gene.2005.09.010. PMID 16289629. ↑ Yang XJ, Seto E (2008). "Lysine acetylation: codified crosstalk with other posttranslational modifications". Mol. Cell. 31 (4): 449–61. doi:10.1016/j.molcel.2008.07.002. PMC 2551738 . PMID 18722172. ↑ Eddé B, Denoulet P, de Néchaud B, Koulakoff A, Berwald-Netter Y, Gros F (1989). "Posttranslational modifications of tubulin in cultured mouse brain neurons and astroglia". Biol. Cell. 65 (2): 109–117. doi:10.1016/0248-4900(89)90018-x. PMID 2736326. ↑ Maruta H, Greer K, Rosenbaum JL (1986). "The acetylation of alpha-tubulin and its relationship to the assembly and disassembly of microtubules". J. Cell Biol. 103 (2): 571–579. doi:10.1083/jcb.103.2.571. PMC 2113826 . PMID 3733880. ↑ Alberts, Bruce (March 2002). Molecular Biology of the Cell. Garland Science. ISBN 0815332181. ↑ Weinberg, Robert A. (2013). Biology of cancer. (2. ed.). [S.l. ]: Garland Science. ISBN 0815342209. ↑ Brooks CL, Gu W (2011). "The impact of acetylation and deacetylation on the p53 pathway". Protein Cell. 2 (6): 456–462. doi:10.1007/s13238-011-1063-9. PMID 21748595. ↑ Tang Y, Zhao W, Chen Y, Zhao Y, Gu W (2008). "Acetylation is indispensable for p53 activation". Cell. 133 (4): 612–626. doi:10.1016/j.cell.2008.03.025. PMC 2914560 . PMID 18485870. ↑ Yamaguchi H, Woods NT, Piluso LG, Lee HH, Chen J, Bhalla KN, Monteiro A, Liu X, Hung MC, Wang HG (2009). "p53 acetylation is crucial for its transcription-independent proapoptotic functions". J. Biol. Chem. 284 (17): 11171–11183. doi:10.1074/jbc.M809268200. PMC 2670122 . PMID 19265193. ↑ Vassilev LT, Vu BT, Graves B, Carvajal D, Podlaski F, Filipovic Z, Kong N, Kammlott U, Lukacs C, Klein C, Fotouhi N, Liu EA (2004). "In vivo activation of the p53 pathway by small-molecule antagonists of MDM2". Science. 303 (5659): 844–848. Bibcode:2004Sci...303..844V. doi:10.1126/science.1092472. PMID 14704432. ↑ Shangary S, Wang S (2009). "Small-molecule inhibitors of the MDM2-p53 protein-protein interaction to reactivate p53 function: a novel approach for cancer therapy". Annu. Rev. Pharmacol. Toxicol. 49 (1): 223–241. doi:10.1146/annurev.pharmtox.48.113006.094723. PMC 2676449 . PMID 18834305. ↑ Zajkowicz A, Krześniak M, Matuszczyk I, Głowala-Kosińska M, Butkiewicz D, Rusin M (2013). "Nutlin-3a, an MDM2 antagonist and p53 activator, helps to preserve the replicative potential of cancer cells treated with a genotoxic dose of resveratrol". Mol. Biol. Rep. 40 (8): 5013–5026. doi:10.1007/s11033-013-2602-7. PMC 3723979 . PMID 23666059. ↑ Kumamoto K, Spillare EA, Fujita K, Horikawa I, Yamashita T, Appella E, Nagashima M, Takenoshita S, Yokota J, Harris CC (2008). "Nutlin-3a activates p53 to both down-regulate inhibitor of growth 2 and up-regulate mir-34a, mir-34b, and mir-34c expression, and induce senescence". Cancer Res. 68 (9): 3193–3203. doi:10.1158/0008-5472.CAN-07-2780. PMC 2440635 . PMID 18451145. ↑ Kreis, ed. by Thomas; Vale, Ronald (1999). Guidebook to the cytoskeletal and motor proteins (2. ed.). Oxford [u.a. ]: Oxford Univ. Press. ISBN 0198599560. ↑ al. ], Harvey Lodish ... [et (2013). Molecular cell biology (7th ed.). New York: W.H. Freeman and Co. ISBN 142923413X. ↑ Fojo, edited by Tito (2008). The role of microtubules in cell biology, neurobiology, and oncology ([Online-Ausg.] ed.). Totowa, N. J.: Humana Press. ISBN 1588292940. 1 2 Friedmann DR, Aguilar A, Fan J, Nachury MV, Marmorstein R (2012). "Structure of the α-tubulin acetyltransferase, αTAT1, and implications for tubulin-specific acetylation". Proc. Natl. Acad. Sci. U.S.A. 109 (48): 19655–19660. Bibcode:2012PNAS..10919655F. doi:10.1073/pnas.1209357109. PMID 23071314. ↑ Hubbert C, Guardiola A, Shao R, Kawaguchi Y, Ito A, Nixon A, Yoshida M, Wang XF, Yao TP (2002). "HDAC6 is a microtubule-associated deacetylase". Nature. 417 (6887): 455–458. Bibcode:2002Natur.417..455H. doi:10.1038/417455a. PMID 12024216. ↑ Teresa Carlomagno, ed. (2009). Tubulin-binding agents : synthetic, structural, and mechanistic insights. contributions by K.-H. Altmann. Berlin: Springer. ISBN 3540690360. ↑ Zito, edited by Thomas L. Lemke, David A. Williams; associate editors, Victoria F. Roche, S. William (2013). Foye's principles of medicinal chemistry (7th ed.). Philadelphia: Wolters Kluwer Health/Lippincott Williams & Wilkins. ISBN 1609133455. ↑ Müller-Decker, Friedrich Marks, Ursula Klingmüller, Karin (2009). Cellular signal processing : an introduction to the molecular mechanisms of signal transduction. New York: Garland Science. ISBN 0815342152. ↑ Yuan ZL, Guan YJ, Chatterjee D, Chin YE (2005). "Stat3 dimerization regulated by reversible acetylation of a single lysine residue". Science. 307 (5707): 269–273. Bibcode:2005Sci...307..269Y. doi:10.1126/science.1105166. PMID 15653507. ↑ Lee H, Zhang P, Herrmann A, Yang C, Xin H, Wang Z, Hoon DS, Forman SJ, Jove R, Riggs AD, Yu H (2012). "Acetylated STAT3 is crucial for methylation of tumor-suppressor gene promoters and inhibition by resveratrol results in demethylation". Proc. Natl. Acad. Sci. U.S.A. 109 (20): 7765–7769. Bibcode:2012PNAS..109.7765L. doi:10.1073/pnas.1205132109. PMID 22547799.